Thora Renee Birch, nada nos Ánxeles (California) o 11 de marzo de 1982, é unha actriz estadounidense. Durante a década de 1990 foi unha recoñecida actriz infantil, protagonizando filmes como All I Want for Christmas (1991), Patriot Games (1992), Hocus Pocus (1993), Now and Then (1995), e Alaska (1996). Despois diso comezou a ter papeis máis maduros, destacando en filmes como American Beauty (1999), The Hole (2001) e a aclamada Ghost World (2001). Ó longo da súa carreira recibiu varios nomeamentos para os premios Emmy, Globos de Ouro e BAFTA. 1989 Doogie Howser, M.D. Megan Episodio: "Vinnie Video Vici"
1990 Married People Emily Episodio: "To Live and Drive in New York"
1991 Amen Brittany Episodio: "Nothing Says Lovin'..."
1994 Monty Ann Sherman Episodio: "Here Comes the Son"
1995 Outer Limits Aggie Travers Episodio: "The Choice"
1997 Promised Land Allison Rhodes Episodio: "Running Scared"
1997 Touched by an Angel Erin Episodio: "The Pact"
2002 Night Visions Susan Thornhill Episodio: "The Maze"
2005 My Life as a Teenage Robot Vega (voz) Episodio: "Escape from Cluster Prime"
Tom Green, Birch e Neil Hamburger no 2006. 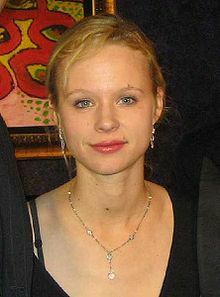 Thora Birch na IMDb (en inglés). A última edición desta páxina foi o 7 de setembro de 2018 ás 21:40.